The timeless beauty and durability of paving stone can transform your house into your dream home. 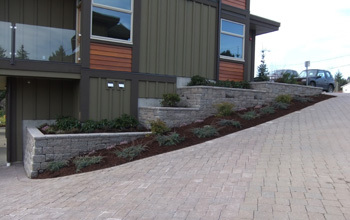 Bring your living space outdoors with paving stone, retaining walls, or rockwork. Individually or in combination, any of these elements can make an outdoor living space that people dream about! Whether it be full-on patios for enjoying everyday outdoor living or entertaining friends and family, paving stones, retaining walls, or rockwork would be a beautiful expression of your outdoor lifestyle. Nothing gives a home more curb appeal and adds value to your property like a paving stone driveway and pathway or garden retaining walls in block or rockwork. With many types, textures, and colours to choose from, you are only limited by your imagination! "I would like to thank you for the excellent job you did for us and for the highly commendable service Island West Paving Stone provided. Your service from start to finish has been exemplary, knowledgeable and professional, yet friendly. Long may you continue to set standards for others to folllow"